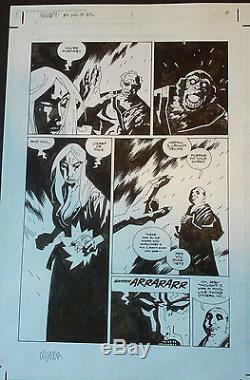 This Hellboy original art piece is by artist Mike Mignola and is from Box Full of Evil issue 1 page 8. The companion page to this one was just listed also, so if you want both back-to-back pages from this sequence then don't miss out! This page measures 11" x 17" and is in excellent condition. Item will be packaged securely and sent quickly. The item "Mike Mignola Hellboy original art Box Full of Evil 1 pg 8" is in sale since Monday, September 26, 2016. This item is in the category "Collectibles\Comics\Original Comic Art\Other Original Comic Art". The seller is "motuctime" and is located in Prescott, Arizona. This item can be shipped to United States.